Springwell Senior Living in historic Mt. Washington is pleased to announce that Elias Leceta Gomez-Nebreda is the community’s new Musician in Residence. Elias, pursuing a graduate cello performance degree at Peabody Institute of the Johns Hopkins University, will be living and performing at Springwell until summer 2019. As part of the Musician in Residence program, Elias has his own apartment alongside Springwell residents. He will perform at least one hour each day in the common areas and hold monthly concerts for residents and guests. In addition to his experience with the cello, Elias, who is from Spain, also sings and plays other instruments such as the flamenco guitar and maracas. 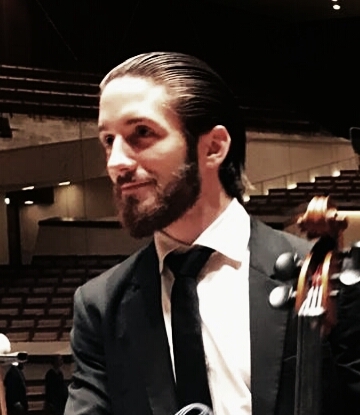 As a cellist, Elias has performed in some of the most prestigious concert halls all over the world, such as Lincoln Center in New York, Boston Symphony Hall, Chicago Orchestra Hall, Budapest Opera Hall, and Suntory Hall in Tokyo. He has participated in music initiatives to promote peace and dialog between cultures and pay homage to the victims of violence and natural disasters in Auschwitz Concentration Camp, Fukushima and other places. He has also started and heads up his own charitable music project, Música Hacia Arriba, organizing a concert in a prison in Madrid for the inmates and fundraising concerts for other charitable organizations in Spain. Specially gifted with a great multitask talent, he has composed, recorded and performed many classical, jazz and flamenco pieces. He has performed as a cello, piano and flamenco guitar player in some of the most renowned jazz halls in Madrid. He has also worked as a teacher in many different music areas of study, with over a hundred students of all ages, from toddlers to seniors. Elias follows last year’s Artist in Residence Sarah Lynn, who specialized in the baroque flute and was a graduate student at the Peabody Institute.